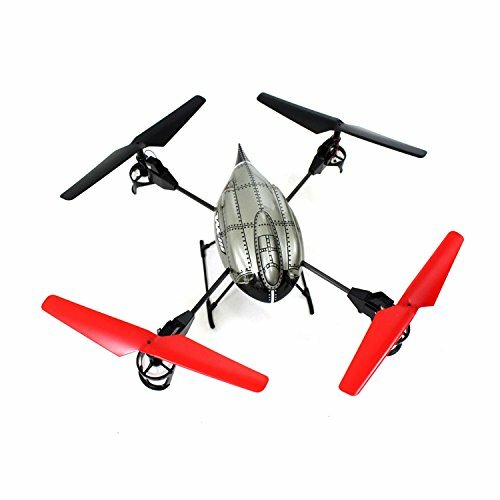 1 x 5.1" WLtoys V959 4-Axis 4 CH RC Quad copter w/ Camera, Lights, and Gyro 2.4G . Description. Remote Control Function: Raise Down/Forwards Backwards/Left Right Turning/Left Right Crab Flying/Hanged Flying/360 Degree Rotating/Video Photo Catch. With 2.4G Transmitter, Easy Adjust Frequency Rave. With 4pcs of Cool Searching Lights, 2 Front Lights and 2pcs Back Lights. Full Scale Remote Control with Built-in GYRO System. Charger is Included in Package, Easy Recharge. Features: Channel: 4CH. Remote Distance: 100 - 300 ft. Flight Time: Approx. 10 minutes. Charging Time: About 50 minutes. Frequency: 2.4GHZ. Weight: 3 pounds. Battery for Quad copter: 1 Piece of Li-Poly Battery 3.7V 500MAH (Included). Battery for Transmitter: 6 pcs of AA Battery (Not Included). Package Contents: 2.4ghz Transmitter with LCD Display. 3.7V 500mAh Li-po Battery. 2G Micro SD Card. AC Charger. Card Reader. Spare Main Blade (4). Instruction Manual. AC Adapter. Recommended Age: 12+. Item Code: HG59 Grey. If you have any questions about this product by WLtoys, contact us by completing and submitting the form below. If you are looking for a specif part number, please include it with your message.